Peregrine Falcons are widely distributed. An aerial hunter, the Peregrine feeds predominantly on avian species and is well known for its tremendous speed when stooping on prey. The population decline of Peregrines in the 1960's caused an environmental awakening with both public and scientific audiences. White, Clayton M., Nancy J. Clum, Tom J. Cade, and W. Grainger Hunt. 2002. 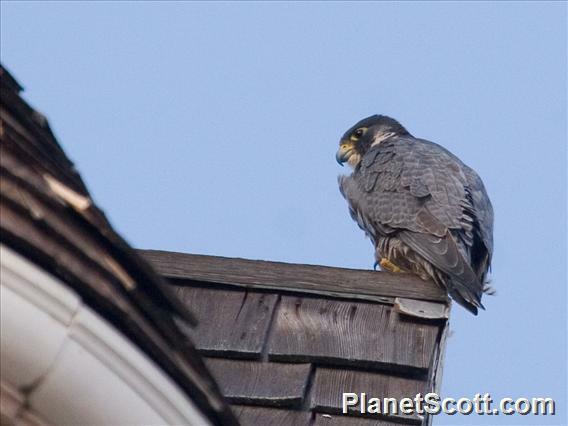 Peregrine Falcon (), The Birds of North America Online (A. Poole, Ed.). Ithaca: Cornell Lab of Ornithology; Retrieved from the . At a lake in a sinkhole near town. Seen in town chasing house sparrows. Dove from the top of a huge cliff. Very fast. Saw a few in the flyover migrating raptors. Church at 23rd and Capp. Briefly viewed, not 100% sure on ID.